The Forgotten American Coalition (FAC) was a short-lived letterhead group founded in 2007 to rally religious conservatives against U.S. withdrawal from Iraq. Chaired by longtime Christian conservative activist Gary Bauer, the group’s membership included a few dozen social conservatives and religious right activists, alongside a handful of prominent neoconservatives and hardline nationalists. Some of the coalition's more notable members included Frank Gaffneyof the Center for Security Policy, Daniel Pipesof the Middle East Forum, Clifford Mayof the Foundation for Defense of Democracies, Herb Zweibon of Americans for a Safe Israel, Pat Robertson of the 700 Club, John Hagee of Citizens United for Israel, Heritage Foundation cofounder Paul Weyrich, and the writer Mona Charen. Echoing President Richard Nixon's appeals to a "silent majority"—which he claimed supported the war in Vietnam and opposed the antiwar movement—Bauer pitched the group as a response to "the defeatism of America’s leftist elites." 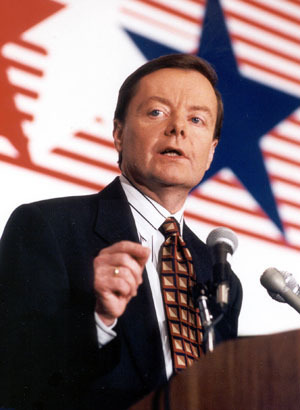 In a blog post promoting the new coalition, Bauer claimed that "while the anti-war Left makes all the noise, the silent majority embraces a more reasoned approach." The group's name appears to be a reference to Barry Goldwater's own "Forgotten American coalition"—a predecessor of Nixon's "Southern strategy" to lure segregationist whites into the Republican fold. FAC main advocacy initiative involved publishing a September 2007 open letter speaking out against a U.S. withdrawal from Iraq. Published as General David Petraeus went before Congress to testify about the deeply unpopular war, the letter echoed both Bush administration talking points and "clash of civilizations" rhetoric about the stakes of the war. "The Iraq War must be seen in the broader context of Islamo-fascism's war on America and Western Civilization," the letter claimed. "It is one front in a global conflict fought from Europe and the Middle East to Africa, the Balkans, the Indian Subcontinent and, finally, to the streets of our cities." Although Iraq's link to the 9/11 terrorist attacks had long been discredited, the letter warned that withdrawal would precipitate similar attacks in the future. "9/11 was in part precipitated by the perception of American weakness and lack of determination," it insisted. "An Iraq withdrawal before our mission is accomplished will convince the terrorists and their state-sponsors that we indeed are the proverbial paper tiger." The letter closed by warning that withdrawal would empower the "isolationist left," leaving "the surrender lobby in charge of U.S. foreign policy for the foreseeable future." The message was specifically tailored for social conservatives. "Historically, values organizations have been reluctant to engage in foreign policy," Bauer wrote in his blog post. "But six years into a struggle that has reshaped understandings of the relationship between war and duty, our unique coalition reaffirms a fundamental insight: Victory is a values issue. We believe defeat at the hands of an ideology that worships death would be immoral." Don Feder, a member of FAC's 10-person steering committee, echoed this sentiment in the group's press release: "By signing this declaration, religious conservatives are saying: 'Yes, we care about marriage, the family, and the unborn,'" he said. "'But we also care about national security, the morale of our servicemen and women, and the war on terrorism.' The left, which thinks neo-cons are the only ones on the right opposing an Iraq withdrawal, had better think again." Despite the group's appeals to "silent" and "forgotten" majorities, critics charged that the group was just another conduit for beltway talking points. Fred Clarkson, co-founder of the blog TalkToAction, told the Inter Press Service that the coalition appeared to be "a classic inside the beltway paper tiger. It doesn't exist," he explained, "except to issue 'messages' to true believers and to make it appear in the media that there is more support for a failed foreign policy than really exists." The group—which has no website or publicly available tax documents—does not appear to have been active after 2007. Bill Berkowitz, "Far Right Sells Iraq War to 'Values Voters,'" Inter Press Service, September 21, 2007, http://www.ipsnews.net/2007/09/politics-us-far-right-sells-iraq-war-to-quotvalues-votersquot/. Gary Bauer, "Victory Is a Values Issue," Human Events, September 14, 2007, http://www.humanevents.com/2007/09/14/victory-is-a-values-issue/. See Jason Morgan Ward, Defending White Democracy: The Remaking of a Segregationist Movement & the Remaking of Racial Politics, 1936-1965 (University of North Carolina Press, 2011), p. 170, http://books.google.com/books?id=bG7mRv1lDWQC&pg=PA170&dq=%22Forgotten+American+Coalition%22&hl=en&sa=X&ei=KNZCU4OEEebisAS_qYAo&ved=0CC0Q6AEwAA#v=onepage&q=%22Forgotten%20American%20Coalition%22&f=false. Forgotten American Coalition, “Values Votes Leaders Sign Declaration against Iraq Withdrawal,” PR Newswire, September 10, 2007, http://www.prnewswire.com/news-releases/values-vote-leaders-sign-declaration-against-iraq-withdrawal-57943002.html.